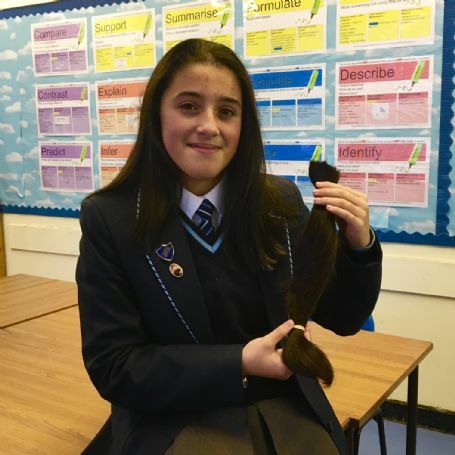 “On Saturday 29th October, I had 15 inches cut off my hair. I have decided that I am going to donate my hair to a very special charity called the “Little Princess Trust”, which is a charity that makes wigs for children who are going through cancer treatment and have lost their own hair. “I wanted to do this because as it is coming up to Christmas, I want to put a big smile on a child’s face, and give them hope. Last August, I sadly lost my Nan to cancer in the Woodlands Hospice. I find I have become much stronger since she has passed away, so this is one reason I want to do this. I want to make her proud and show how much I still love her. Congratulations to Aleisha for taking this brave step! Keep checking back to the website for updates on Aleshia's fundraising.